The new UMC 4+1 machining centre from XYZ Machine Tools is designed to offer a solution for machinists looking for a high-performance cost-effective route to multi-face machining. 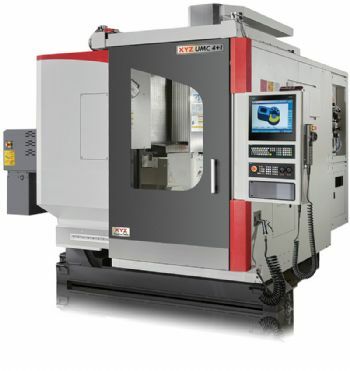 The Burlescombe-based company (www.xyzmachinetools.com) says that, following the success of the UMC-5X simultaneous five-axis machining centre, which was introduced 12 months ago, it recognised a demand for a machine with similar overall capacity but not simultaneous axis movements. The UMC 4+1 retains all the key features of the gantry-style UMC-5X machine, including the 90rev/min direct drive on the rotary axis and the front-loading 600mm-diameter trunnion rotary table with a 600kg load capacity. The standard 12,000rev/min in-line spindle unit with through coolant can be upgraded with options of 15,000, 18,000 and 24,000rev/min units. Prices for the UMC 4+1 will start at under £130,000, which is a saving of around £30,000 over the UMC-5X. Nigel Atherton, managing director of XYZ Machine Tools, said: “When we spoke to customers about the UMC-5X, it became clear that there was strong demand for a 4+1 machine. “By using the UMC-5X as a starting point, we created the UMC 4+1, which has the same machining envelope, with the only major change being the use of the Siemens 828D control, which suits the 4+1 configuration, rather than the simultaneous-motion capability of the Siemens 840D.